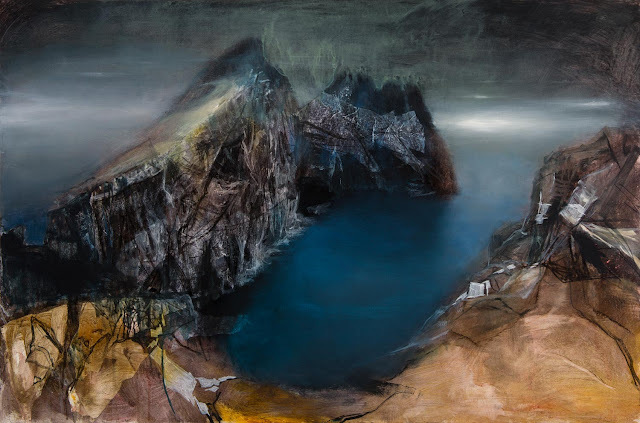 In this stunning new body of work, Beth Robertson Fiddes returns to landscapes in Scotland’s far Northwest, St Kilda and Iceland that have remained with her, bringing us face to face with forces of nature and the power of memory. Refreshingly we’re not just confronted with a scene, but with a highly distilled, residual sense of place, held in the mind. 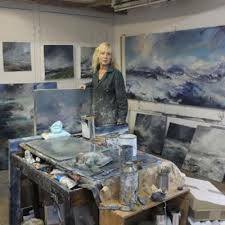 Fiddes’ approach to land and seascape is to experience it directly, often incorporating bold first response drawings, collaged into the ground of her paintings. The strength of these marks and the artist’s adept layering of media reflect the immeasurable depth of the landscape. What is so powerful in this latest work, is seeing the artist embrace her holistic experience of the environment and command of technique, exploring how ideas of North, genetic memory and dreams inform how we see. 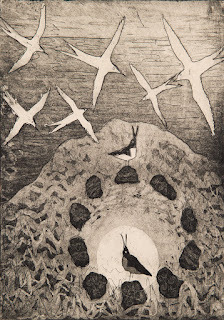 Fiddes has captured what is most essential about our need to connect with the natural world, tapping into an inheritance of understanding that is deeply personal and omnipresent. We’re led into hollows and fathomless pools that trigger the imagination, deep rooted memories and narratives that make us who we are. The cinematic feel of her paintings is the result of a fluid approach to time and a creative process of immersion, shared with the viewer. 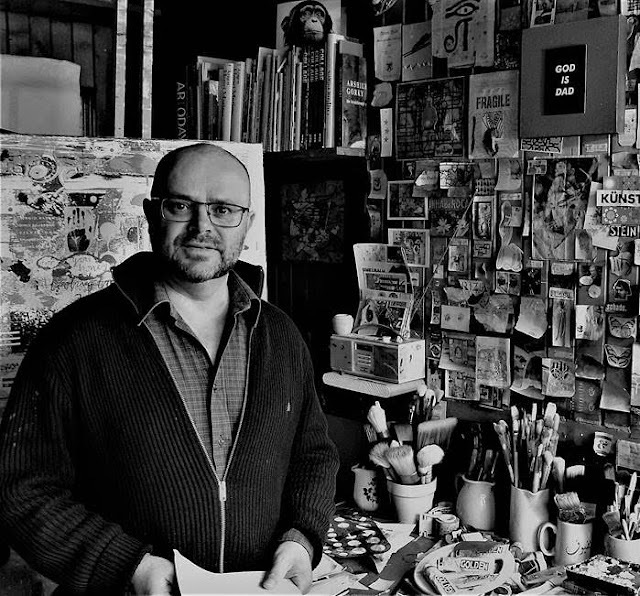 There’s natural meld and resist in Fiddes’ unique handling of drawn elements, burnt marks, adhesive, oils and acrylics. Her richly layered surfaces are as subtle and dynamic as the ever-changing land and seascape. This fluidity is an essential part of the artist’s process, in terms of technical skill, experimentation and as a powerful invocation of human memory. Outstandingly drawn from recollection, the emotional undercurrent, psychological gravity and elusiveness of the Northern landscape is the beating heart of this work. Standing on ancient fissures of rock, we feel we’re in the presence of geological forces more enduring than ourselves, which can be comforting and confrontational. Often the viewer’s foreground is a rocky outcrop, where we stand in awe of nature, in its enormity and indifference to human timescales. These threshold spaces can make us feel exhilarated and equally vulnerable. 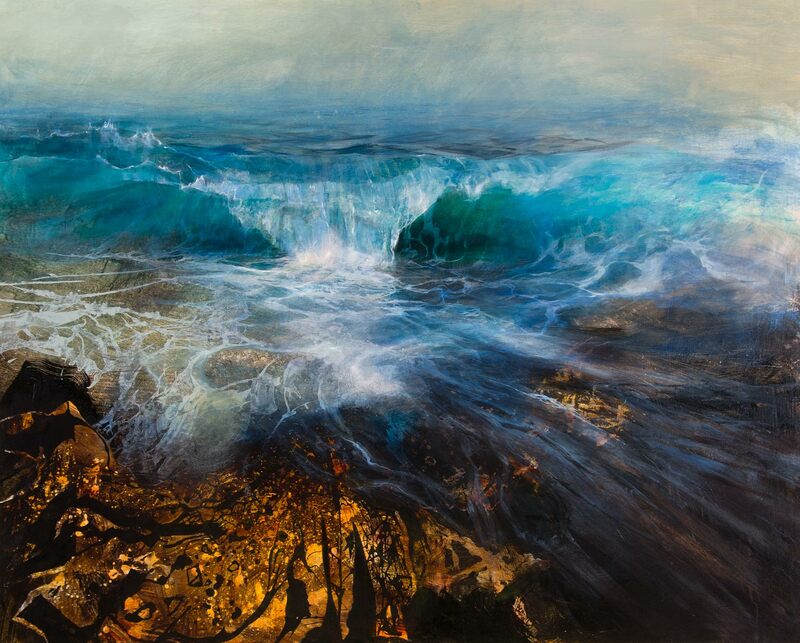 In Big Wave Over Rock (mixed media, 122 x 152cm) we’re held in a moment of anticipation where the tide draws its breath. The mesmerizing pull of an unfurling wave in liquid emerald and turquoise is immediately compelling. The undertow of ocean currents over the golden russet slip of rock and seaweed is palpable. However, there is a wider sense of recognition in this suspended moment, a subtly gathering rhythm of grey forms and tonality behind the beauty of the breaking wave, a feeling of North that binds us to earthly gravity in the foreground and evaporates into the horizon, sea becoming sky. In Dun from Hirta (mixed media, 81 x 122cm) two points of light, the arc of the cliff edge and the inward glow of the horizon beckon us towards a space we cannot physically enter. The monumental landforms which appear as a bridge remain just out of reach, mirroring the way that St Kilda remains fertile ground in the global imagination. Although the landscape is uninhabited, Dun has a figurative presence of its own. 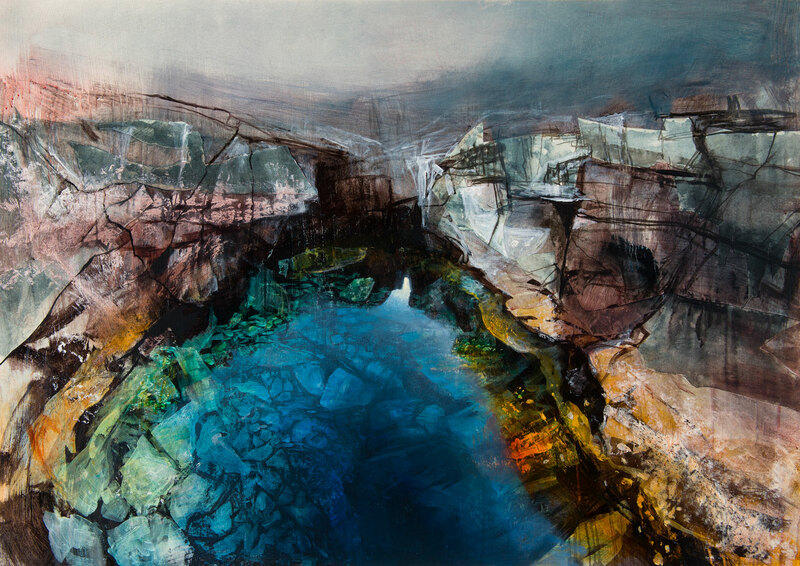 This sense of the landscape as witness is also communicated very powerfully in Immersion (mixed media, 76 x 107cm) where Fiddes’ depiction of a stark, pale ravine creates a space of embrace and reckoning. Based on memories of Thingvellir in Iceland, the artist positions the viewer as witness, drawn into the glacial pool below. Depth of hue and shadow is offset by an apex of light, leading the eye into a shifting atmosphere of mist. Volcanic rifts foreshadow this human amphitheatre, the site of the first parliament, a place of law-making and punishment dating from the 10th Century. Whether we know its history or not, Fiddes’ sensitive rendering of place follows the natural strata of stone and the complex nature of human experience. It is a breath-taking distillation of the North in vision and execution, founded on memory and dreams. BETH ROBERTSON FIDDES Recollection - Northern Dreams is on show at Kilmorack Gallery 16 March - 20 April 2019.